Husband Edward Kimmel, born in Henderson, Kentucky on February 26, 1882, had just been promoted to Admiral, commanding the Pacific Fleet based at Pearl Harbor in February 1941. This promotion followed a long, honorable service record in the United States Navy. Throughout reports from his superiors ran the theme of integrity, leadership, diligence and independence of mind. Following the surprise attack on Pearl Harbor 70 years ago today, Kimmel was relieved of his command, and his rank reverted to Rear Admiral. The Defense Department cited his "dereliction of duty" as the reason. It was suggested that Kimmel ignored intelligence that could have prevented the attack. Kimmel denied that he ever received such intelligence and insisted that he was being used as a scapegoat. "The success of the attack on Pearl Harbor ... was caused by the deliberate failure of Washington to give the Commanders in Hawaii the information available in Washington to which they were entitled," wrote Kimmel in a letter to Missouri Congressman Clarence Cannon on June 3, 1958. It has been claimed that Secretary of the Navy Frank Knox and President Franklin D. Roosevelt were anxious to placate the American people who wondered how the attack on the great battleships and air installations at Pearl Harbor could have come as such a surprise. They relieved Kimmel of his command as well as the Army's top command in Hawaii, General Walter Short. Instead of being reassigned, after 37 years of active duty Kimmel was forced into retirement, in March 1942. To reassure the American people that the war effort was being managed well, and to protect those above Kimmel and Short from harsh criticism, an investigation was ordered. Wartime security measures made it impossible for the Roberts Commission to probe deeply into circumstances leading up to the attack, so questions as to American knowledge of Japanese plans, and as to whether his superiors had kept Kimmel adequately informed of the likelihood of war were never answered. Four later inquiries reached more balanced conclusions, finding that Kimmel could not have prevented the attack, that others shared responsibility for the ineffective American response, and that the most anyone in his position could have done was to order more extensive reconnaissance measures. And even with that, the attack was imaginative and well-executed, and might still have come as a surprise. All his friends, classmates and former shipmates remained loyal to Kimmel, and Admiral William Halsey remained adamant that Kimmel had exercised his command with care and skill. 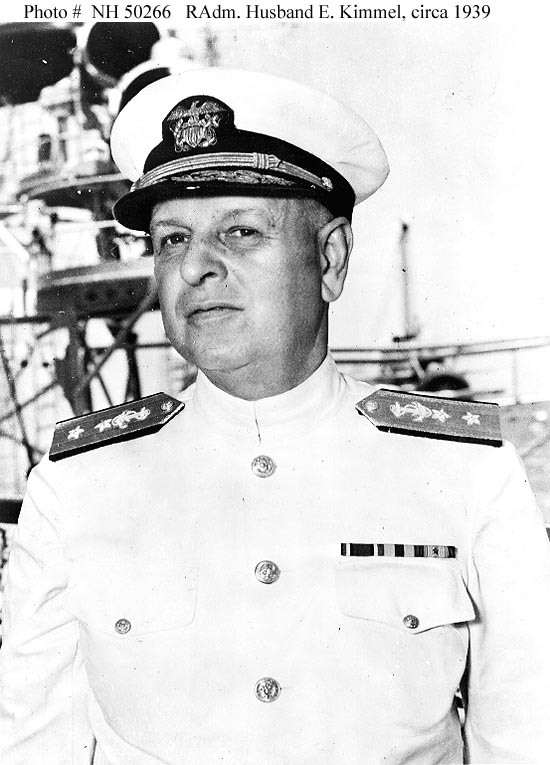 "In all my experience," wrote Halsey in his memoirs, "I have never known a commander-in-chief of any United States Fleet who worked harder, and under more adverse circumstances, to increase its efficiency and to prepare it for war; further, I know of no officer who might have been in command at that time who could have done more than Kimmel did." Some believe that given a chance Kimmel would have made a splendid wartime leader. Others feel that regardless of his merit, his position has been undermined; that without the complete confidence of all above him -- and below as well -- he could not have led as effectively as his equally qualified replacement, Charles Nimitz. Kimmel was exonerated in the eyes of the American public, but his ranking was never restored. Since his death in 1968, Kimmel's son and grandson have worked to have his status as a four-star Admiral restored, and while much evidence exists to legitimize this request, the Defense Department has yet to honor it. Sources: Graybar, Lloyd J. "Pearl Harbor 'Scapegoat'' Louisville Courier-Journal December 3, 1978; Kimmel, Husband E. "Facts About Pearl Harbor"